After initial exams and careful consideration of your dental health, Vancouver family dentist Dr. Nelson may decide that a filling is necessary. You may envision traditional silver fillings, but there are actually many options when it comes to protecting your teeth from decay. What is the Purpose of a Filling? A filling is required when there’s evidence of tooth decay, also known as the development of cavities on the surface of your teeth. Tooth decay is caused by bacteria that, when exposed to sugar, create acid that attacks teeth. Enamel breaks down, creating a hole that is called a cavity. Fillings are materials placed in teeth to stop the progress of tooth decay and protect them for future use. Amalgam has been used for over 100 years in tooth fillings, and is recognized as a standard material in dental procedures. The word “amalgam” comes from amalgamation, which means “mixture.” These fillings include a combination of different metals, including copper, silver, and mercury. 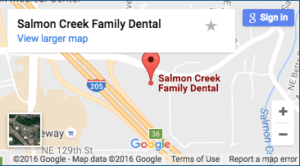 Dr. Nelson and Salmon Creek Family Dental use amalgam-free fillings. The presence of mercury in amalgam fillings has caused controversy in recent years. Mercury is a known toxin, and there has been concern among scientists and dental professionals that mercury is released from these metal fillings when they’re placed and when we use our teeth to chew. With advances in dental technology, amalgam is no longer required for most procedures as it has been used in the past. Instead of amalgam, substitutions made from porcelain or similar composites are used that look and wear like regular teeth – and don’t contain mercury. Should Amalgam Fillings Be Replaced? If you currently have a metal filling, it needs to be regularly evaluated by Dr. Nelson – if it still functions well, it should be left alone. However, if it needs to be replaced, consider talking with Dr. Nelson about alternatives to amalgam fillings. There has been a recent decrease in the use of amalgam, due to the increase of alternative materials for fillings as well as a decrease in the presence of cavities. Avoiding future fillings, however, has a lot to do with a solid daily oral hygiene routine. A balanced diet, brushing your teeth twice a day, and flossing once a day can go a long way toward keeping teeth healthy, strong and free of fillings!